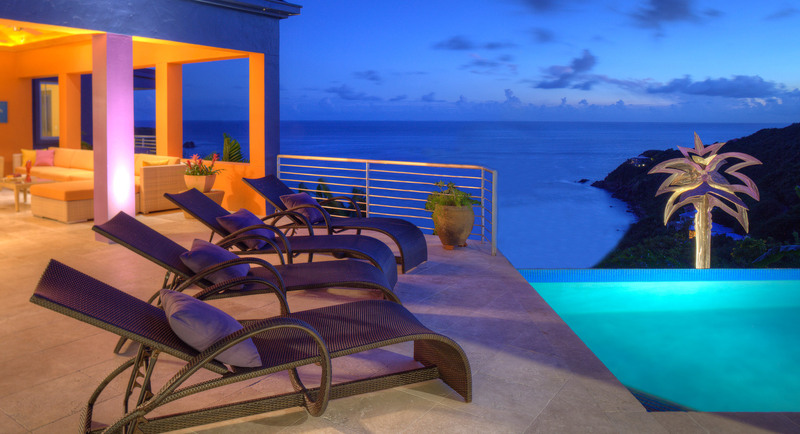 Designed to maximize views and outdoor living, Mare Blu's floor plan, superb design, lighting, and finishes distinguish this spectacular rental villa overlooking Rendezvous Bay on St. John's southern coast. Four spacious pavilions are linked together by generous outdoor living spaces, all overlooking the sparkling pool, tropical gardens, and the ocean. Well stocked with a large variety of glassware, stemware, dinnerware, and cookware. Large island with stainless steel prep sink and a screened pass-through window leading to the outdoor living space. Top of the line stainless steel appliances, including a three-door refrigerator/freezer, standard oven, microwave/convection oven, and two dishwashers. Sliding glass pocket doors lead from Mare Blu's indoor kitchen to its outdoor kitchen. The adjoining outdoor kitchen provides easy service to the alfresco dining room and includes a professional gas grill, second oven, icemaker, and generous countertop space. Guests spend much of their time in the shade of the veranda enjoying the warm sea breeze and reading, listening to music, enjoying cocktails and conversation while taking in the beauty of the seascape. The lounge contains a flat screen television with cable and DVD player. The 55 in flat screen can be viewed while afloat in the 48' pool. The lounge also includes refrigerator drawers for drinks and snacks, a closet filled with floats and pool toys, and a powder room for convenience. A large stock of fresh beach towels is always waiting in the laundry room. From one end of this amazing outdoor space to the other, the ocean views are framed with color and texture by a garden of tropical plants. Pool toys, noodles, floats, beach chairs, coolers, beach towels, and binoculars are all available for your convenience. The villa has high-speed wireless internet. There are telephones throughout the villa. All cell phones work on the island but can be sporadic at times, ATT cell phones work best on St. John (with no roaming). Mare Blu Villa has full air-conditioning throughout the villa. For privacy, a security gate is installed at the top of the villa driveway. There is a generator with the automatic transfer switch. If the electric power goes off, the generator will start in 3 seconds and the power in the villa will be restored. Mare Blu has amenities galore. The fine details, too numerous to include here, can be found below and on the other pages of this website. Property owners, Teri and Bernie, welcome you to contact them with any questions that remain unanswered or any special needs that you may have. Upper Pavilion's Blue Suite = 1 queen.